Stephen Lawrence, a local consignment store that typically carries gently worn medium – high end items, is having their bag sale March 16th & 17th 2012. $20 gets you a bag and full of end of season clothes. Whatever you could stuff into the bag was yours. I thought it was too good to pass up and I just found out that the proceeds are going our KY neighbors who lost everything in some recent tornados. I got there promptly at 11am and was done by noon. There were no dressing rooms so you had to be able to really eyeball your size and style across a wide range of brands. 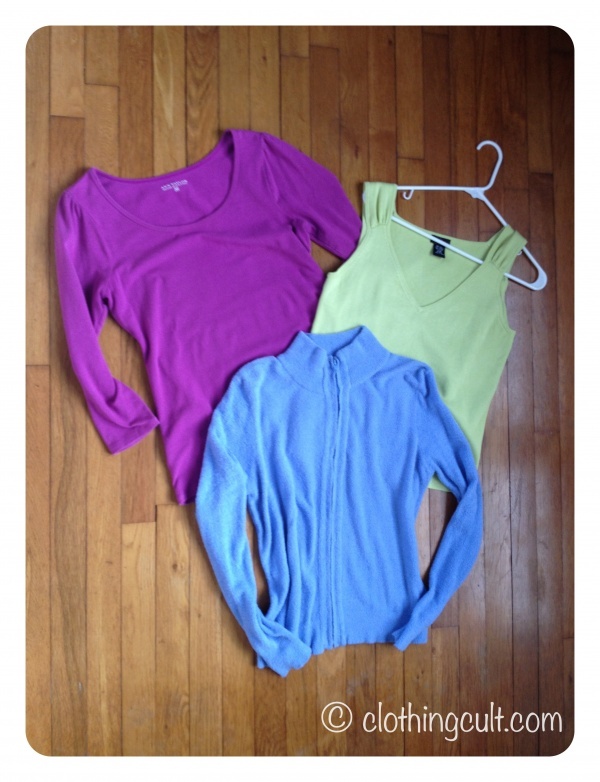 13 pieces that look good, 3 of which were pants / bottoms! The 3 that didn’t fit (picture below): “Banana Republic” maroon 100% silk top, “INC” maroon patterned top 100% silk, “For Joseph” lightweight darkwash 100% cotton jean trousers. The lightweight jeans were my biggest disappointment because they look bigger than the other pants I picked up that seem to have magical shrinking powers and seem 3 sizes too small when I try them on. Brand new with tags and a dark wash. I tired them on twice because I really thought I was having a pants trying on failure moment but nope, they just plain didn’t fit. 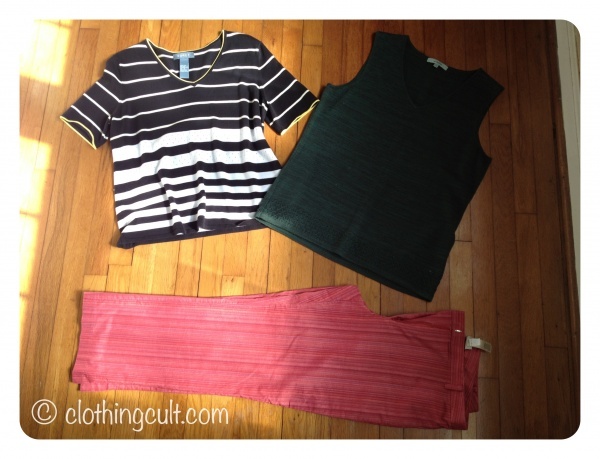 The 3 that weren’t flattering on me (below): “Nurture” 100% Merino hunter green tank, “Koret” Black and white striped T (with some little yellow stripes), “Sigrid Olsen Sport” red thin-stripped capris. 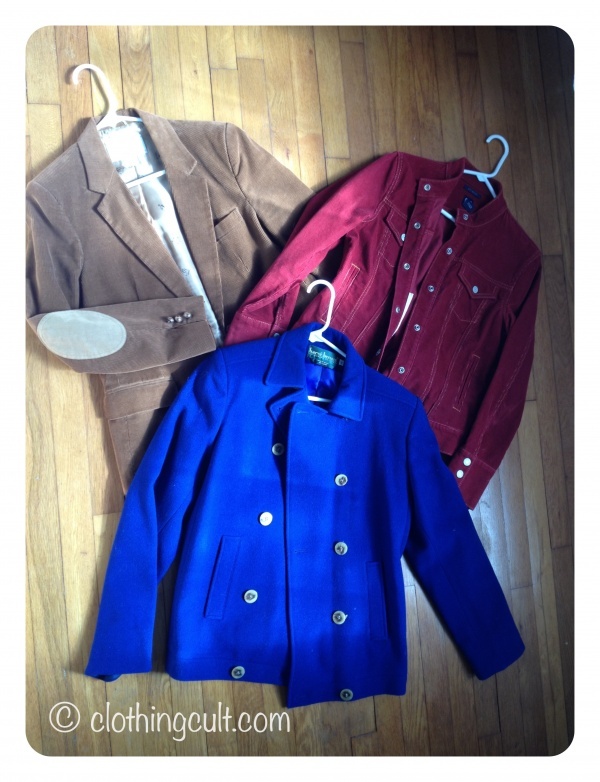 The Coats / Jackets (below): “Gap” red / rust colored stretch corduroy jacket in a jean jacket style, “The F.L. Collection” brown / auburn colored corduroy fitted jacket with elbow patches, “Harvé Bernard by Senard Roltzman” vibrantblue (UK blue) 70% wool, 20% nylon pea coat (I need to sew the buttons tighter) but is one of my favorites that I picked up. 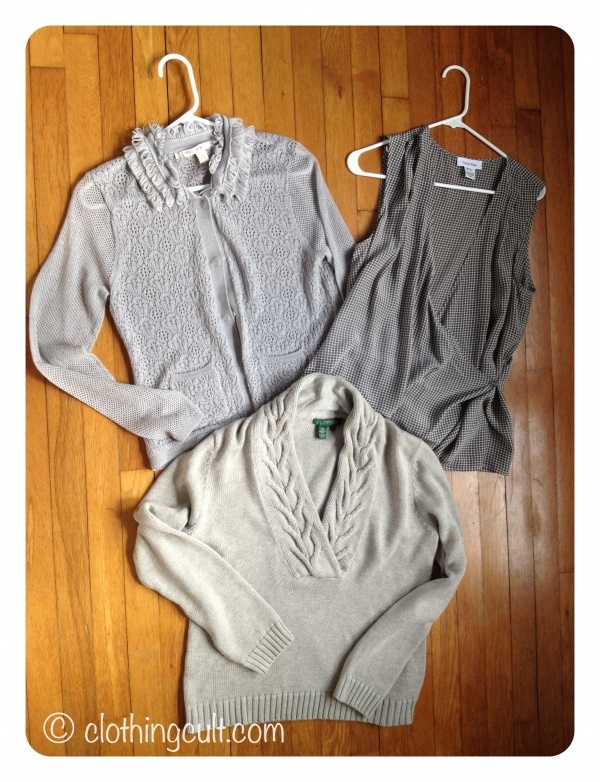 The Grays (below): “Lauren by Ralph Laren” cotton shawl collar sweater which is another favorite, “Chelsea & Violet” 53% wool, 25% acrylic lightweight snap front cardigan, “Calvin Klein” 100% silk wrap front sleeveless blouse which needs a cami under it. The Pants / Bottoms: “Talbots” cotton khakis new with tags they have a horse riding inspired look to them and are a nice thickness, “J.H. Collectibles” aqua capris, “Studio Y” brown dress shorts / capris they hit below the knee … which sounds bad but they look better on than you would think. 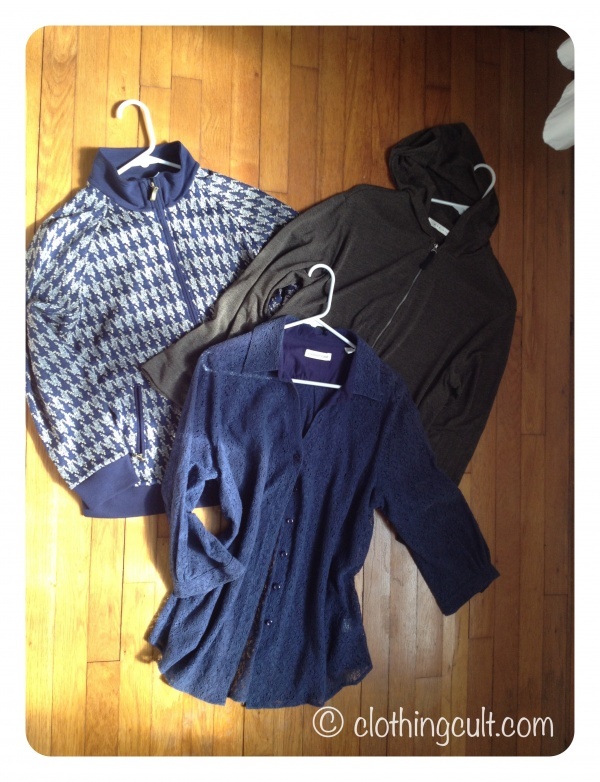 More layers: “Allison Daley” navy, cream and metallic gold large houndstooth jacket, “Max Studio” black and gold (non-metallic) lightweight hoodie, “Coldwater Creek” navy lace button up shirt with three quarter length sleeves. 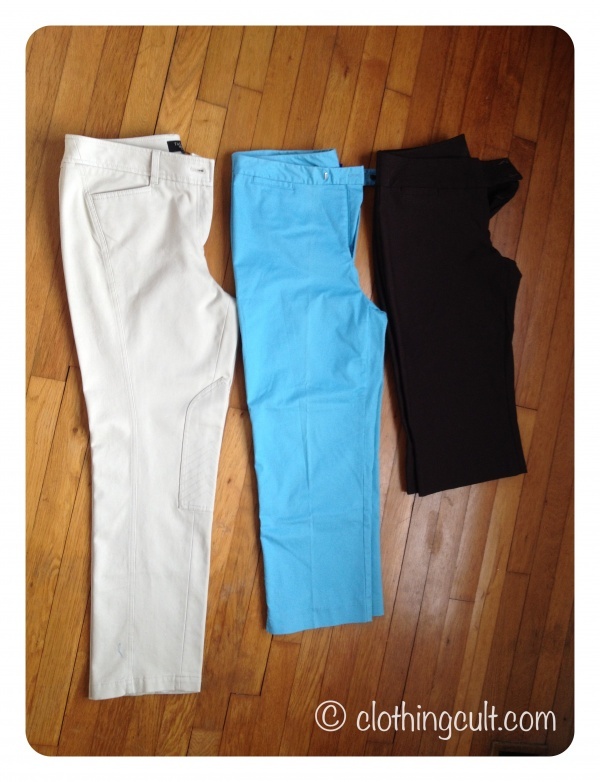 then onto the pants because they didn’t seem to have as much in my size range as other sizes. I wanted to pick over them before other people. 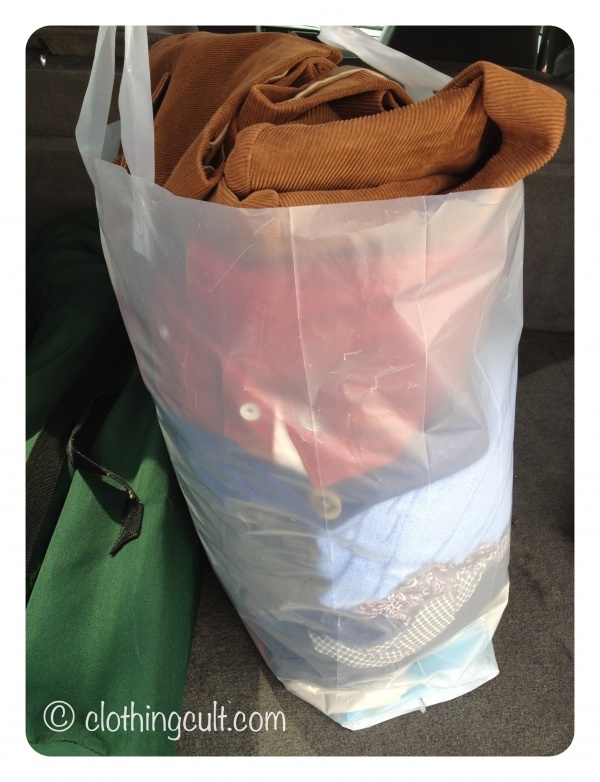 removed the garment from the hanger and neatly folded it and placed in the bag. then I still had some space left in the bag so I glanced at the shoes again, not seeing anything in my size, and headed off to the room with the jackets and coats. Since jackets and coats take up a lot of space and because they can be tried on over things I went ahead and tried on quite a few but there were still no mirrors so I held onto those I wasn’t sure of until I was done and repeated steps 1-5 again. The blue coat had gone immediately into my bag after being tried on. My favorites of the bunch are a vibrant UK blue coat, a Ralph Lauren grey shawl collar sweater, and the fact I actually have three new pairs of bottoms. Have you ever participated in a bag sale? What did you think and is it common for them to not have dressing rooms? Do you have a plan of action going in in order to get the best deals?